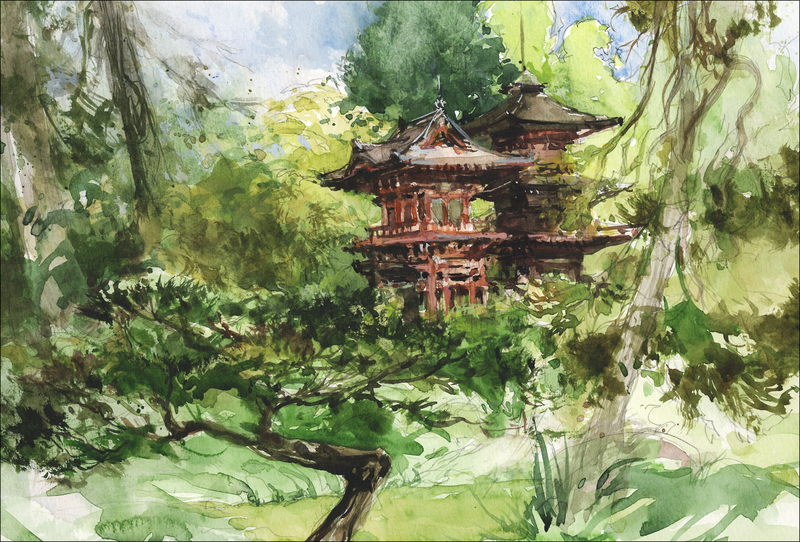 Last weekend at Golden Gate Park we visited the Japanese Tea Garden. It’s a small park-within-a-park just west of the De Young Museum and before you get to the botanical garden. There’s an admission fee – $5 for SF residents, a little bit more for visitors – not sure why, possibly it’s partially taxpayer funded? Whenever we go I see great many people step just inside the gate mill around a bit, before deciding the fee is a bit much just to look at trees and ponds. Fine with me! It remains a tranquil oasis inside the park – relatively free of kids, dogs, and soccer balls. The foliage is beautiful all year round – but for me the attractions are these two intricate Pagoda style structures (subject of the painting), an arched ‘moon bridge’ and various excellent carved and lacquered gates made by imported veteran woodworkers. There’s also a large bronze Buddha. (Photo op!) and a cute tea house/restaurant. I recommend touring the whole place and getting your photos, then returning to the Tea house for some tea and mochi! Funny exchange of the day – one lady from out of town – (I’ll refrain from mentioning her home state) wanted me to reassure her that it was impossible to make a living as an artist, and was quite put out that I wouldn’t tell her daughter to forget plans for art school. She was shocked that I’d been steadily employed since the day I graduated, and wouldn’t believe I make a decent living, until I gave up and assured her my day job is “all done by computers”. I do have to be honest – 10 of those years I was an art director – so I drew almost every day, but also did a lot of business-like activities. (I would make very pretty excel sheets. Color coded). So I’ve only ‘become an artist’ full time in the last few years. (My 40’s as well). So I feel like if you’re going to do it, don’t wait too long!!! There’s a lot of catching up to do. Life is short, art is long is the phrase that comes to mind. Good luck with it! If we can pull it off, we deserve a party at 60. It is amazing how trees are free and wild and rich and different. And do not stick into one green ball like in my sketches:-). I started to draw at 40. And at a moment I think drawing will be my pleasure, and I will earn by my other business. But who knows, to be a full time artist sounds so good.